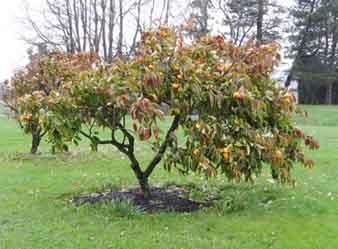 Persimmons are tolerant of a variety of soil types and are easy to grow. 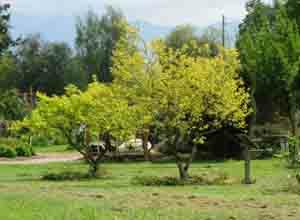 Young trees should be irrigated, but older trees are more drought-tolerant. They should be pruned to a multi-trunked open center or a central leader scaffold system. Pruning is usually not required on older trees except to maintain tree size or correct faults such as broken limbs. Fruit is born on the current year’s wood. Asian persimmon leaves are a lovely chartreuse color in April. 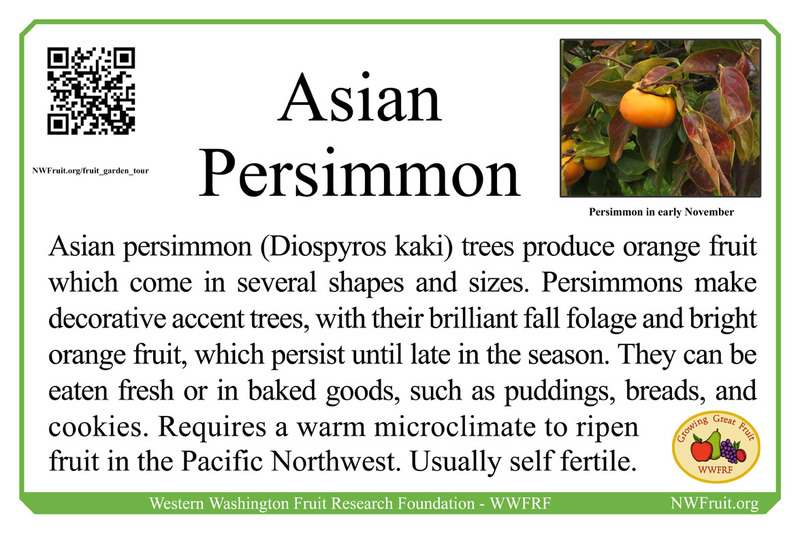 Persimmons are susceptible to biennial bearing, with a larger crop every other year. To avoid this thin at least half of the developing fruit within a month of bloom if the fruit set is heavy. A mature tree can produce 35 to 75 lbs. of fruit. Harvest persimmons with hand clippers and cut close to the calyx. They can be stored for up to 3 months just above freezing. Unripe persimmons will become more ripe in a warm room. While both Asian and American (Diospyros virginiana) varieties will grow in the maritime northwest, it is the Asian variety that is grown commercially, mainly in California. Great Wall and Saijo varieties have ripened in some trial years. American varieties, which make a larger tree, are native to the Southeast but will grow throughout the U.S. Unripe fruit of American persimmons can be astringent and should be allowed to ripen on the tree into early winter. Of the American persimmons, Garretson, Early Golden and Meader will ripen and have good flavor. Choose a site with full sun and allow the fruit to ripen on the tree, even into freezing temperatures. Meader is the only American persimmons variety that is self-fertile. Other American varieties require both male and female trees to allow the female trees to fruit. Trees may be propagated by seed, root cuttings or grafts, but seeds must be cold-stratified to produce. 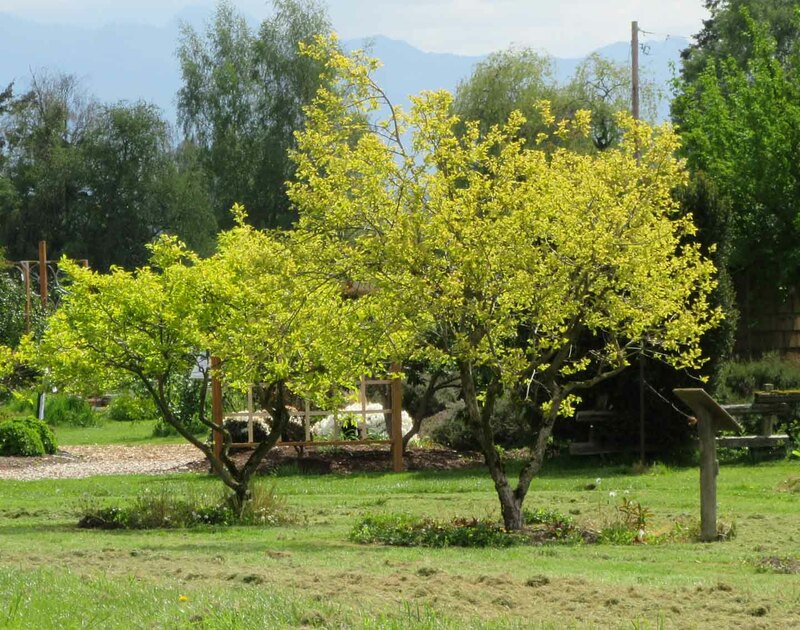 Seedlings should be transplanted into the orchard when they are 1-2 years old, since older trees develop a taproot that makes transplanting difficult. Persimmons will begin bearing in 4-8 years depending on the method of propagation. Saijo – Earliest. Probably the most reliable for most areas of western Washington. Izo – Earlier than Jiro. Jiro – May not ripen every year.